Hand-made 360 stadiums, band portraits, fan-campaigns, we asked you what you've been building 'from the ground up' and you're posting content thick and fast. Here's some of the entries so far, check out the gallery in Zootopia. Baby Claw from Thomas Latour is pretty impressive. Nine year old twins Keren & Adi worked for three days to build their own U2360 Stage. Marcela Gonzalez in Colombia built her own fan campaign. BratBeef built a tower... from his personal collection of U2 releases. TheGuitarPlayer556 was only five when he first heard Vertigo on the radio - and his clip explains why he remains a fan. Sorry guys nothing beats the real thing. Baby Claw Baby shmaw!! We have been there from the start when we saw 4 very young boys on a barge singing Glory! What a glorious day that was. They stole our hearts in 1981 when most of you were not even born yet! We are the original U2 Fans Forever from the cradle to the grave. When we knew Bono before he wore his shades and when he had long hair. Oh yeah and Edge too. Dovidenja nashe brache! Bog! U2 cake built from the ground up! I met Vincent (Vinny) in the queue for tickets for the 360 tour and was bowled over by his stories of starting queues for many years for tickets and albums queuing for days and through the cold nights. Through talking to him it was clear his passion and dedication for the band gets him through these long queues. I think he deserves one of these signed books - he'd be absolutely thrilled to get one! I agree with other posters. This was purely an amazing job well done. Blew me away to watch how meticulously spot on this project was in comparison to the real thing. kudoes your paintings are really good! I met Vincent Kearns while he was in the queue for the 360 tour tickets in Dublin. He started the queue 4 days before the tickets went on sale and sat on the sidewalk all this time exposed to the elements. He is such a loyal fan of the band and has always started the queue for tickets for a tour and for the release of an album at HMV in Grafton Street. He deserves one of these signed books for his true dedication. Sure been in many a queue with Vincent whose comment is below, over the last 20 or so years, unfortunately HMV on Grafton Street in Dublin is gone now. It was were we queued for the Albums and tickets too before ticketmaster took over at the St. Stephens Green shopping centre. Its cool to see all the entries coming in,its been fun to think of something and I enjoyed building my entry,its submitted but not up.on here yet,good luck to all entries !!!!!! My twin girls Keren & Adi are so proud of being in the U2 website!!!! they worked very hard for it. they want to say THANK YOU!!! they are among the youngest u2 fans... the new generation of u2 lovers! Since it's not credited here, I just wanted to say that the paintings featured at the head of this post is one of my entries to the comp and a selection of paintings I've done mostly for friends. My name is Dianne Delahunty and you can see more at www.diannedelahunty.com Thanks! I started the Queue in Dublin at Ticket Master in St Stephens green shopping centre for the release of the tickets for the Dublin gigs in Croke Park. Spent 4 days sitting outside the store with another guy. By day 4 we had a few thousand people join us. I have being doing this for over twenty years now (starting the queue) for concert tickets and the release of new albums. 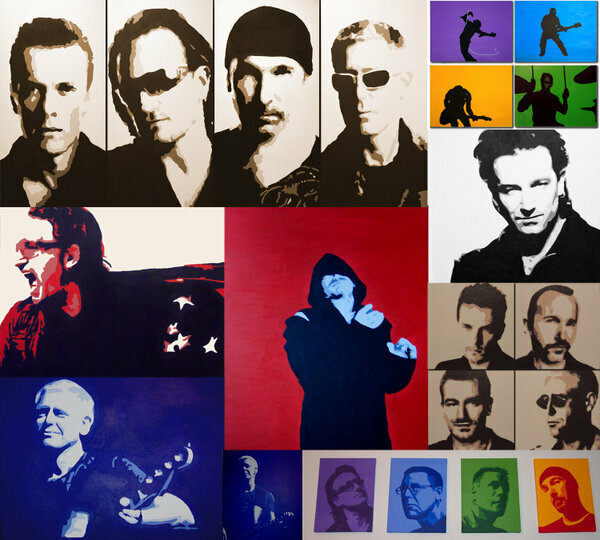 And have met a lot of U2 fans over time and stayed in touch. From Buenos Aires Argentina, Happy Birthday Adam Clayton!!! I think Baby Claw deserves all five books. All of these are great! Keep them comimg. I'm not that creative but want to see more. Thats a winner right there surely!